Create muscular thighs without leaving the floor. Muscular thighs give your legs shape, definition and strength. The front of your thigh includes a group of four muscles referred to as the quadriceps. The hamstrings are a group of muscles on the back of your thigh. Another group of small muscles, called adductors, comprise your inner thigh. You can achieve strong thighs without any special equipment or leaving the comfort of your living room floor. Seated leg raises target your quadriceps without weights or other equipment. Sit with your back against a wall for stability and to protect your back from strain. Extend your legs in front of you. Inhale. As you exhale, pull your belly button toward your spine for core stability and lift one leg up as high as you can, keeping your leg straight and your foot flexed. Slowly lower your leg down, without touching your heel to the floor. Repeat for up to 20 repetitions, then repeat on the other side. The Pilates single-leg circle targets all of your thigh muscles. Begin flat on your back with your arms at your sides and your palms facing down. Pull one knee into your chest and extend it toward the ceiling, leaving your other leg extended and resting on the floor. Point your toe, then trace five small circles on the ceiling using your toes as the "pencil." Make sure to keep your hips firmly planted on the floor. Repeat the circles in the opposite direction. Switch legs and repeat, then perform a total of five sets on each leg. Increase the difficulty by tracing the letters of the alphabet with each leg, rather than circles. Work your inner thighs with leg lifts that target the adductors. Lie on your side and bend your top leg, letting the knee and calf extend over your bottom leg to rest on the mat. Extend your bottom leg, pointing your toe. Slowly lift your bottom leg about six inches off the mat and hold for three seconds. Lower your leg back down, controlling the movement by squeezing your adductors. Stop just before it touches the mat again and repeat. Gaiam Life recommends performing two sets of 10 inner thigh leg lifts three times a week to see results. Vary the leg lifts by flexing your foot for a set, or by alternating between flexing and pointing your foot within each set. Yoga's bridge pose targets all of your thigh muscles in addition to your glutes and abdominals. Perform the bridge by lying on your back. 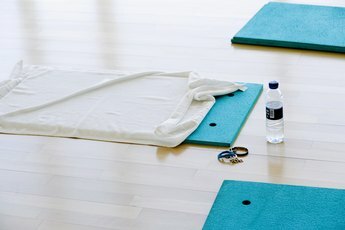 Bend your knees, resting your feet flat on the mat a few inches from your bottom. Engage your core by pulling your belly button in toward your spine. Exhale, then slowly lift your bottom off the mat as you squeeze your glutes and push your knees forward away from your hips. Lift your hips to form a diagonal line from your knees to your shoulders, keeping your shoulders firmly planted on the mat. Hold bridge pose for 30 seconds or longer, breathing deeply and squeezing your knees toward each other. Slowly roll back down on an exhale and repeat three to five times. Alternatively, perform short, quick glute squeezes while your hips are raised.